Figure 1. (a) Crystal structure of the prototypical TI Bi2Se3. (b) Schematic of the electronic structure of Bi2Se3 showing the bulk valence (BVB) and conduction (BCB) bands and the linearly-dispersing surface states spanning the bulk band gap. (c) Large-scale STM topograph of ~6 quintuplet layers of Bi2Te3 grown on Bi2Se3 in our home-built MBE system. Moire pattern created due to a small lattice mismatch between Bi2Te3 and Bi2Se3 can be clearly observed. Inset in (c) shows the final post-growth RHEED image of the Bi2Te3/Bi2Se3 heterostructure grown. (d) STM topograph zoomed-in on the red square in (c) showing atomic resolution. All data was acquired at ~4.5 K using the STM in our lab. Using MBE, we can create heterstructures of various TIs to generate new phenomena. For example, Fig. 1(c,d) shows a long-scale Moire pattern formed in a thin film of Bi2Te3 grown on top of its TI cousin Bi2Se3. Figure 2. 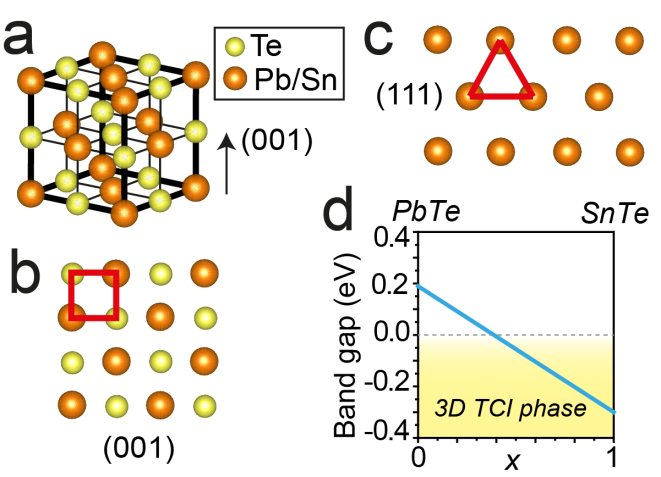 (a) Bulk cubic crystal structure of prototypical TCI (Pb,Sn)Te and (b,c) different surfaces achieved. (d) Phase diagram indicating bulk band gap vs composition at ~10K. In contrast to TRS-protected Z2 TIs, TCIs are a state of matter in which the topological phase is protected by a discrete group of crystalline symmetries (TRS is still present but not crucial). Although TCIs are classified as trivial under the Z2 classification due to even number of points within the first Brillouin zone (BZ) where the bulk band inversion occurs, topological protection by crystalline symmetries commands the presence of topological Dirac states. Numerous types of symmetries can in principle lead to a TCI phase (rotation, reflection, etc. ), but only one class of 3D TCIs based on mirror symmetries in IV-VI rock-salt cubic semiconductor Pb1-xSnxTe (and related Pb1-xSnxSe) has been experimentally realized so far in a wide range of alloying compositions (Fig. 2). Fundamental properties of Dirac fermions observed in Z2 TIs still hold in TCIs, such as linear dispersion, chiral spin texture and symmetry protection of the Dirac surface states. However, Dirac fermions in TCIs are tunable across a much wider parameter space, providing a rich playground for the exploration of novel phenomena. For example, mirror-symmetry protection of the Dirac points allows controllable opening of the Dirac gap via ferroelectric distortion without breaking TRS. Strain is expected to cause pseudomagnetic fields similar to those observed in graphene and unconventional superconductivity, while both strain and alloying composition change can induce topological-to-trivial crossover by lifting the band inversion, and shifting the Dirac cones in momentum space, as these are not pinned to TRS-invariant points. Figure 3. The schematic of heterostructures of topological materials and superconductors (SCs) expected to host proximity-induced topological superconductivity at the surface. The interest in TSCs has been ignited by the prediction that these systems host Majorana fermions (MFs), exotic particles that are also their own antiparticles governed by non-Abelian statistics. The quest for achieving TSCs is motivated not only by physical implications of MFs in particle physics, but also by the prospects of their utilization in applications. Theoretically, TSCs can be classified into multiple different categories based on the presence or absence of time-reversal and spin-rotation symmetries. Time-reversal-invariant TSCs have garnered much of the attention of experimentalists due to the multitude of theoretically proposed systems with different geometries which could be experimentally realized both in 2D and 3D. In 2D, time-reversal-invariant TSC is a superconducting cousin of Quantum Spin Hall state with a new flavor of helical Majorana modes at its boundary. The most prominent theoretical proposal for realizing such a phase involves creating a heterostructure of an s-wave SC and a Z2 TI which should give rise to proximity-induced superconductivity at the surface of TI (Fig. 3), with MF bound states inside magnetic vortex cores at zero energy. 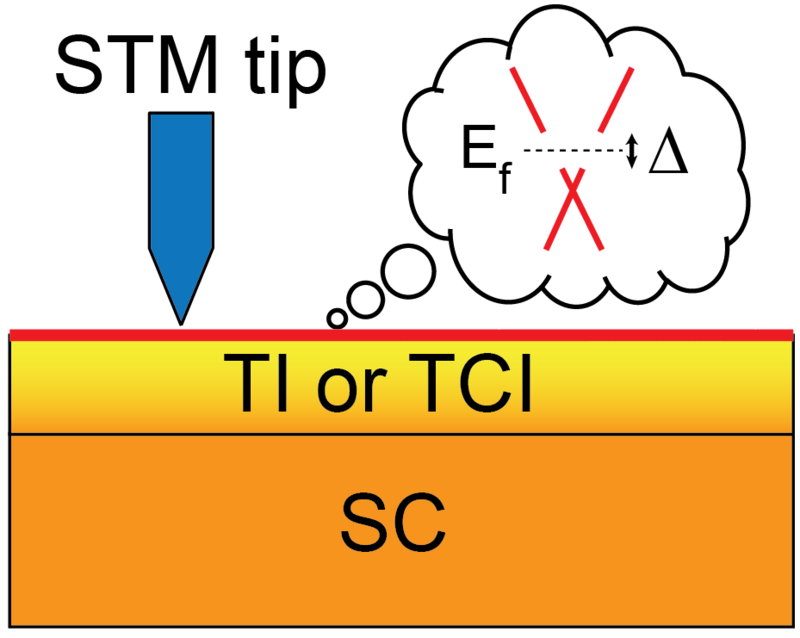 In 3D, time-reversal-invariant TSC can be viewed as a superconducting counterpart of a TI, with superconducting gap in the bulk but topologically protected electronic states at its surface. MF in this geometry would be delocalized at the surface, gapless, with the dispersion spanning the SC gap. Promising candidates to host topological materials include several systems, including Cu-intercalated Bi2Se3 and In-doped Pb1-xSnxTe.